Captain Eric Mayer, U.S. Army JAG: I had the pleasure of spending last summer with the Army JAG in Fort Leonard Wood, Missouri. Captain Mayer was the defense attorney in the office, and he was phenomenal in the courtroom. Whenever there was a court martial, I sat in the audience and watched him in complete awe. He never seemed uncomfortable or at a loss for words. I don’t think he ever wrote a script for anything he did, not even his opening statement. When he questioned a witness, he didn’t have a list of questions. He put a list of the information he needed to get out of the witness to build his case and would check off each one once he got the answer he needed. I was intimidated by his skills just from sitting in the audience. Professor Dallyn’s Applied Evidence Class: This course taught us how to apply the rules of evidence to a courtroom situation. Every day we did role plays where we took turns playing the parts of the questioning attorney, the opposing counsel, and the witness who on the stand. The final for the class was a fake trial. I tried to use Captain Mayer’s approach to questioning a witness, but found myself needing a script of questions and feeling flustered while the opposing counsel and I were making objections. 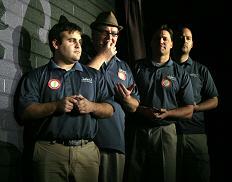 Improv AZ’s Coroner Prank #2: I’m a founding member of Improv AZ, a local performance troupe in the Phoenix area. After our success with the Coroner Prank on the light rail in October 2009, we decided to repeat it at a local mall. Things did not go according to plan, and we were confronted by the mall cops who called the real cops. My fellow coroners were former professional improv actors. When things turned sour, they slipped back into improv mode. I turned seven shades of white and tried not to pass out while reserving my right to remain silent. Thankfully the cops let us go after questioning us and the mall cops banned us from the mall for three months. Check out my legal analysis of the event and the video. My class started a little over two weeks ago with Jester’Z Improv and it has been amazing. It’s a 12-week course that ends with a showcase for our friends and family. I hope that taking this class will help improve my ability to think on my feet. Having been a gymnast and a singer for most of my life, you might think that taking improv acting would be easy. However, in both of these activities, the performance is completely scripted. With improv, you don’t know what’s going to happen until you’re up on the stage. It’s a bit unsettling when you don’t know what your partner is going to say or what scenario you might be playing out. I went to the Jester’Z Improv show featuring the regular cast and nearly peed my pants from laughing. Part of me simply enjoyed the show and part of me was a student trying to absorb ideas from the actors and thinking, “Oh geez, these are the games I might be in during my showcase! How am I going to pull this off?” It’s going to be awesome. Photo courtesy of Jester’Z Improv Comedy Troupe. The Jester’Z is a fun troupe, and I hear their founding members are all geniuses. Geniusii? Either way, you’ll have a lot of fun and looking forward to seeing your showcase! I hear some of the founding members will be at my showcase. I hope I make them proud. I’ve been surprised by how much of improv is about connecting with your fellow actors and not about trying to be funny. It’s about being in the moment. I love it – even though I’m still pretty nervous every time I step up on stage. Great post Ruth, glad you didn’t pee your pants at the show! This might have been a completely different post if you would have peed your pants. I’m still trying to make a good impression on my improv elders. I’m sure they’d be impressed that someone was so moved by their performance that they left a puddle. But that would be icky, especially for me since I walk around bare foot on that floor every week at class! Ruth, thank you for your kind words. I am truly humbled. That summer was a particularly trying one for me as an advocate. With 9 contested trials in 3 months, it certainly challenged me as both an attorney and human. I never would have guessed that last summer was such a challenge for you. You always carried yourself with such poise and charisma in the courtroom. I’m so excited for you and your own law firm!! I hope you’ll keep me in the loop about everything you’re doing.